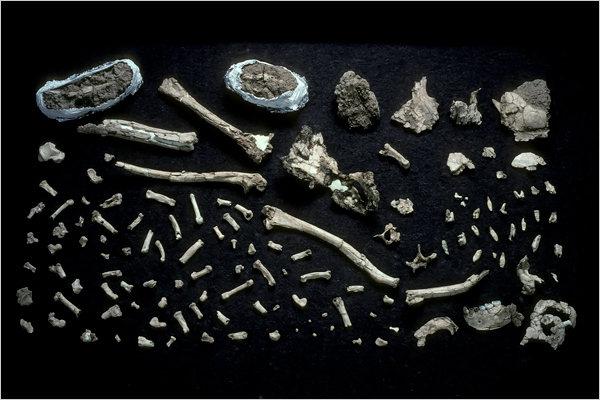 The first of these pictures - the photograph detailing the partial fossilized skeleton of Ardi on the left - was released by the American Association for the Advancement of Science (AAAS) in association with press conferences announcing the history of the discovery of Ardi, and her kind, in Ethiopia that were simultaneously held in both Addis Ababa, Ethiopia, and Washington D.C., U.S.A., on 1 October 2009. The second of our series of images - the drawing of Ardi on the right - is sketched by J.H. Matternes and comes from the same source. It is a visualization based on the fossil find and represents a hominid female who weighed about 50 kilograms (110 pounds) and stood about 120 centimeters (just under 4 feet) tall. There was extensive coverage of the Ardi skeleton in the well-regarded magazine Science, as regularly published under the auspices of the AAAS, in a special edition of 2 October 2009. Special editions of Science magazine are infrequent and this one is largely devoted to the Ardi fossilized skeleton discovery. Researchers have given the name Ardi - short for Ardipithecus ramidus - to the most complete specimen out of more than 35 Ardipithecus ramidus fossil hominids so far discovered. 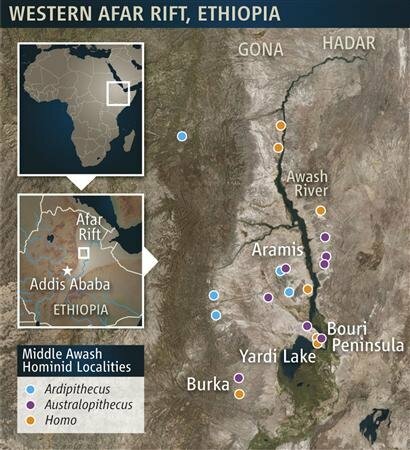 The name Ardipithecus ramidus was arrived at using traditional Greek suffixes but preceding them with words in the local Afar language in which Ardi means "ground" and ramid means "root." The resulting Ardipithecus ramidus terminology being intended to mean "root of the ground ape." In their investigations into this particular fossilized skeleton discovery a team of researchers have have painstakingly pieced together some 125 fragments of bone - including much of the skull, hands, feet, arms, legs and pelvis. Tim White who directs University of California, Berkeley’s, Human Evolution Research Center and a co-leader of the Middle Awash research team that discovered and studied the new Ardipithecus ramidus fossils, has stated, "To understand the biology, the parts you really want are the skull and teeth, the pelvis, the limbs and the hands and the feet. And we have all of them." The first find of fossilized remains of Ardipithecus ramidus was made in 1992 when the shiny polished surface of a molar tooth was spotted among pebbles in a semi-arid desert area of northern Ethiopia. Several more teeth and small bones were found soon afterwards and these were subsequently classified as having belonged to a hominid species. The many fragments of fossil bone that have now been recognised as having belonged to the individual Ardipithecus ramidus now known as Ardi were found at a site where, late in 1994, one of a team of researchers who were crawling shoulder to shoulder across a promising patch of desert where erosion had exposed clay sediment near the village of Aramis in the Afar Triangle made the discovery of two finger bones which he immediately estimated as being from a hominid. Painstaking recovery operations followed on from this discovery and subsequently continued into 1997. On discovery Ardi was found in a very fragmented condition. Badly broken elements such as the untrained eye sees here were interpreted by professional palaeontologists - with the aid of specialised computer software - into a scientific opinion about Ardi's skeleton and bodily form. Due to their extreme fragility the fossilized skeleton remains have had to undergo extensive scientific recovery and cleaning and preservation prior to detailed examination and assessment over the past 15 years. It appears that the fossil remains were somewhat scattered and broken to the extent that the research team suggest the specimen itself had probably been trampled by a large animal before it became fossilized. The skull alone was found in more than 60 fragmentary pieces and it had been crushed so as to finally occupy only a couple of centimeters of depth in the clay in which it had been "completely flattened". Due to the evident thicknesses of some of the bones the research team think that Ardi was probably a female. The Ardi fossilized skeleton has been dated using the volcanic layers of soil above and below the find as being from 4.4 million years ago. 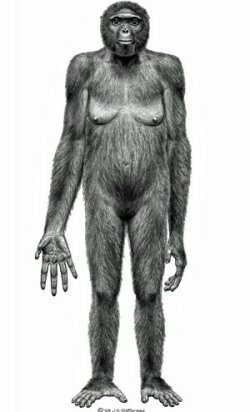 This means she displaces the famous pre-human Australopithecus afarensis / Lucy fossil, (found in Africa in 1974 - just 74 kilometres from where the fossil remains of Ardi were found), itself dated from 3.2 million years ago as being from the earliest "reliably known about" fossil from a possible close human ancestor species. The Ardi fossil discovery seems to be that of another important missing link fossil that could do much to fill the large gap in scientific knowledge about primate evolution before the "Lucy" Australopithecus afarensis skeleton, but after the hominid line split from the line that led to today's chimpanzees and to open a window into a period of human evolution we have known little about. That period when early hominids were establishing themselves in Africa, soon after diverging from the last ancestor they shared with the African apes. 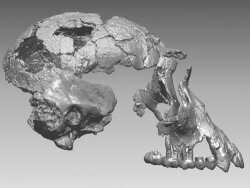 A Japanese team investigated the Ardi fossil discovery using specialised X-ray and Computed Tomography scanning. The research team have suggested that even if Ardi is not on the direct evolutionary line in terms of human origins, the fossilized skeleton will definitely yield new insights into the evolution of the earliest ancestors of mankind and how we evolved from the common ancestor we share with chimps, bonobos, gorillas and other higher primates. "In Ardipithecus we have an unspecialized form that hasn't evolved very far in the direction of Australopithecus. So when you go from head to toe, you're seeing a mosaic creature, that is neither chimpanzee, nor is it human. It is Ardipithecus." 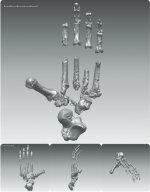 A digitally rendered composite image from Science showing the foot of the "Ardi" partial fossil skeleton. The angle of Ardi's head compared with her spine together with the evident nature of her feet, pelvis, legs, and hands suggest she was well capable of walking on two legs although with a stooped posture. The lack of arches to her feet, however, indicate some limitations to the time she could comfortably spend walking and to the distances that she could comfortably travel. Running would have been difficult. The pelvis and hip show the gluteal muscles were positioned so to allow walking upright on the ground but Ardi could climb using all four limbs when moving about in the trees. The big toes of her feet were opposable for grasping and the pelvis structure would have allowed her to negotiate tree branches. “When climbing on all fours, she did not walk on her knuckles, like a chimp or gorilla, but on her palms. No ape today walks on its palms." Other features of the fossilized skeleton suggest it was not suited, like the skeletal structure of modern-day chimps, to swinging or hanging from trees or to walking on front-limb knuckles. Contemporary chimps often have robust quarrels over food or in relation to access to females who are ready to breed. The facts that the canine teeth near the front of the mouth in both male and female Ardipithicus are much smaller than a modern chimp's canines, and that there seems to have been little difference in the adult size of males and females, both lead the research team to strongly infer a relatively squabble-free group existence for Ardi and her kind - and even, perhaps, an existence where there was a possibility for monogamous and co-operative pair bonding with males bringing foods to females with whom they had paired. Ardi's dentition and her tooth enamel is such as to suggest a largely, but not exclusively, vegetarian diet of fruits and roots with insects, eggs and perhaps small mammals varying the menu. Species that feed on tough abrasive foods generally have a thick tooth enamel wheras Ardi's was of an intermediate thickness. Diet affects the carbon isotopes residing in tooth enamel - an analysis of Ardi's tooth enamel suggests a diverse diet, including fruit and other woodland-based foods such as nuts and leaves. Experts believe Ardi is very, very close to the last common ancestor of humans and chimps, thought to have lived five to seven million years ago. Her discovery tends to re-cast science's previously accepted view of pre-human ancestors as being chimp-like and to regard hominid characteristics as being more ancient than previously thought. There is even speculation that chimps and gorillas might have developed their habits of walking on their knuckles relatively late in association with greater specialisation toward arboreal patterns of life and that chimps and gorillas have themselves also evolved substantially since the time of the last common ancestor with humans. "We can't say this species was a direct ancestor of modern humans, so we have to be careful. But it suggests that the direction of early hominids was away from the chimp." "People think that modern chimpanzees have not changed and therefore, our common ancestor looked like a chimp ... As if it was only the human branch that evolved. In fact, Ardi is more primitive than a chimpanzee." "What is fascinating is that Ardipithecus is closer to our last common ancestor than is the modern chimpanzee." Such speculation holds that the findings suggest that this last common ancestor of humans and primates, which existed nearly 2 million years earlier, was a primitive creature that shared few traits with modern-day members of either group. One of the researchers has asserted that "The common ancestor looked like Ardi. It's the chimp and gorilla that have evolved enormously, not hominids. 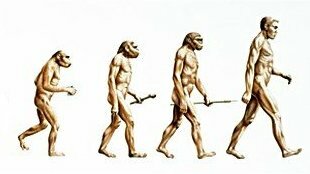 Hominids have concentrated their evolution in two things -- upright walking and brain. Everything else is pretty primitive." "Darwin said we have to be really careful. The only way we're really going to know what this last common ancestor looked like is to go and find it. Well, at 4.4 million years ago we found something pretty close to it...And, just like Darwin appreciated, evolution of the ape lineages and the human lineage has been going on independently since the time those lines split, since that last common ancestor we shared." "With Ardipithecus, we have to bear in mind this was a species that lived 4.4 million years ago, and a lot has happened since then in human evolution, when it comes to behavior." Although the Afar Triangle area of Ethiopia is now a semi-arid desert, the scientists have found fossilized wood and seeds alongside the Ardipithecus ramidus bones and consider that it would have featured woodland 4.4 million years ago. "Just as we send planetary missions into deep space, this was a mission into the deep past, into Planet Earth's past, and into our past." Oxygen isotopes found in the fossil remains suggest that the climate in Ardi's time and place was humid and relatively cool rather than tropical. The other fossils discovered come from fig, hackenberry and palm trees, and from 29 species of birds, such as swifts, doves, lovebirds, owls and peacocks. Also evident are snails, 20 new species of small mammals, (including bats, shrews and mice), and larger animals, such as hyenas, bears, rhinoceroses, elephants, monkeys and antelope. This would seem to indicate that our ancestors began walking upright in open woodland settings, not on grassy savannas as prior generations of researchers had, (it would perhaps be fair to say) confidently, speculated. Under such speculation bipedalism was seen as very necessary to gain sight of potential predators and to find food in open grasslands. As with the Lucy fossil that of Ardi had a relatively large brain, about the size that of a modern femaled chimpanzee, and about a third of the size of that of modern man. Her hands with their opposable thumbs were capable of grasping, and the holding and manipulation of objects is believed to have been an essential attribute that allowed primates scope to become gradually more intelligent as it allowed them to pick things up, to manipulate them and, in the case of chimps and humans, to use them as tools. Such features of the Ardi fossilized skeleton discovery support the view that the expansion in brain size came long after the evolution of upright walking on two legs.